The 1946 World Series was played in October 1946 between the St. Louis Cardinals (representing the National League) and the Boston Red Sox (representing the American League). This was the Red Sox's first appearance in a World Series since their championship of 1918. In the eighth inning of Game 7, with the score 3–3, the Cardinals' Enos Slaughter opened the inning with a single but two batters failed to advance him. With two outs, Harry Walker walloped a hit over Johnny Pesky's head into left-center field. As Leon Culberson chased it down, Slaughter started his "mad dash". Pesky caught Culberson's throw, turned and—perhaps surprised to see Slaughter headed for the plate—supposedly hesitated just a split second before throwing home. Roy Partee had to take a few steps up the third base line to catch Pesky's toss, but Slaughter was safe without a play at the plate and Walker was credited with an RBI double. The Cardinals won the game and the Series in seven games, giving them their sixth championship. As the first World Series to be played after wartime travel restrictions had been lifted, it returned from the 3-4 format to the 2–3–2 format for home teams, which has been used ever since. It also saw the return of many prominent players from military service. The Red Sox struck first in Game 1 when Pinky Higgins followed a hit-by-pitch and walk in the second with an RBI single off Howie Pollet. 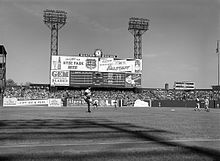 The Cardinals tied the game in the sixth when Red Schoendienst singled, moved to second on a ground out, and scored on Stan Musial's double off Tex Hughson. They took the lead in the eighth when Whitey Kurowski singled with two outs and scored on Joe Garagiola's double. Pollet was a strike away from closing the game when Tom McBride tied the game with an RBI single with two on. Rudy York hit a home run into the left field bleachers in the tenth to put the Red Sox up 3–2. Earl Johnson pitched two shutout innings to close to give Boston a 1–0 series lead. The Cardinals struck first in Game 2 when Del Rice hit a leadoff double in the third off Mickey Harris and scored on Harry Brecheen's single. They added to their lead in the fifth with two unearned runs on Terry Moore's RBI single with two on followed by Stan Musial's groundout. Brecheen pitched a complete game shutout as the Cardinals tied the series heading to Boston. In Game 3, Rudy York's three-run home run in the first off Murry Dickson gave the Red Sox an early 3–0 lead. They added another run in the eighth off Ted Wilks when Red Schoendienst misplayed Hal Wagner's ground ball with two on. Dave Ferriss pitched a complete game shutout to give the Red Sox a 2–1 series lead. Enos Slaughter's lead-off home run in the second off Tex Hughson put the Cardinals up 1–0. Whitey Kurowski doubled and scored on Harry Walker's single. Walker moved to third on an error before scoring on Marty Marion's groundout. Next inning, Stan Musial's two-run double extended the Cardinals' lead to 5–0. Jim Bagby relieved Hughson and allowed a two-out RBI single to Garagiola. The Red Sox got on the board in the fourth when Ted Williams singled off Red Munger and scored on Rudy York's double, but the Cardinals got that run back in the fifth on back-to-back doubles by Enos Slaughter and Kurowski. Garagiolas's RBI double in the seventh off Bill Zuber made it 8–1 Cardinals. Bobby Doerr hit a two-run home run in the eighth, but the Cardinals put the game out of reach in the ninth. Three straight singles to lead off made it 9–3 Cardinals. Mike Ryba relieved Mace Brown and allowed a two-run double to Marty Marion, then an error on Red Schoendienst's ground ball scored the last run of the game. Munger pitched a complete game to tie the series for St. Louis. Ted Williams hit a RBI single, his only RBI of the whole Series, in the first off Howie Pollet. After the Cardinals tied the game in the second on Harry Walker's RBI double after an error off Joe Dobson, Don Gutteridge's RBI single off Al Brazle in the bottom of the inning put the Red Sox back up 2–1. Leon Culberson's home run in the sixth made it 3–1 Red Sox. Next inning, after a double, strikeout and intentional walk, Pinky Higgins's RBI double made it 4–1 Red Sox. After another intentional walk loaded the bases, shortstop Marty Marion's errant throw to second on Roy Partee's ground ball allowed two more runs to score. Dobson allowed a two-run single in the ninth to Harry Walker before retiring Marion to end the game and put the Red Sox one win away from the championship. St. Louis staved off elimination at home, chasing Boston starter Mickey Harris with a three-run third. With two on and one out, Terry Moore's sacrifice fly scored the game's first run. After a single, back-to-back RBI singles by Whitey Kurowski and Enos Slaughter made it 3–0 Cardinals. The Red Sox scored their only run of the game in the seventh when Rudy York hit a leadoff triple and scored on Bobby Doerr's sacrifice fly. Marty Marion added an RBI double in the eighth off Earl Johnson to back Harry Brecheen's second win of the Series. The Red Sox struck first in Game 7 on Dom DiMaggio's sacrifice fly after two leadoff singles off Murry Dickson. The Cardinals tied the game in the second when Whitey Kurowski hit a leadoff double, moved to third on a groundout and scored on Harry Walker's sacrifice fly off Dave Ferriss. In the fifth, Walker hit a leadoff single and scored on a double by Dickson, who scored on Red Schoendienst's single. The Cardinals led 3–1 in the eighth inning when Dom DiMaggio tied the game with a two-run double but was pulled from the game after pulling a hamstring and Leon Culberson took his position in the center field. In the bottom of the frame, Enos Slaughter scored from first base on a play called the Mad Dash. As the runner started, Walker lined the ball to left-center field, where Culberson fielded the ball. As he threw a relay to shortstop Johnny Pesky, Slaughter rounded third base, ignored third base coach Mike González's stop sign, and continued for home plate. The run put the Cardinals ahead 4–3 and proved to be the winning run. Harry "The Cat" Brecheen had come out of the bullpen during Boston's rally in the eighth when the Red Sox had two men on base, and he gave up the double by DiMaggio that tied the game. Brecheen allowed two singles to start the ninth inning, but then retired the Red Sox without giving up a run, to record his third victory of the Series. This was the first World Series appearance for the Red Sox since 1918, and it would be their last appearance until 1967, when they would again lose to the Cardinals in seven games. However, the Red Sox would win the next two World Series matchups with the Cardinals, sweeping them in 2004 to break an 86-year championship drought, and then defeating them in six games in 2013 (Boston's third in ten years). The World Series loss snapped the Red Sox's record of winning their first five postseason series, a feat that would not be matched until the Florida Marlins did it 57 years later in the 2003 National League Championship Series. ^ "1946 World Series Game 1 – Boston Red Sox vs. St. Louis Cardinals". Retrosheet. Retrieved September 13, 2009. ^ "1946 World Series Game 2 – Boston Red Sox vs. St. Louis Cardinals". Retrosheet. Retrieved September 13, 2009. ^ "1946 World Series Game 3 – St. Louis Cardinals vs. Boston Red Sox". Retrosheet. Retrieved September 13, 2009. ^ "1946 World Series Game 4 – St. Louis Cardinals vs. Boston Red Sox". Retrosheet. Retrieved September 13, 2009. ^ "1946 World Series Game 5 – St. Louis Cardinals vs. Boston Red Sox". Retrosheet. Retrieved September 13, 2009. ^ "1946 World Series Game 6 – Boston Red Sox vs. St. Louis Cardinals". Retrosheet. Retrieved September 13, 2009. ^ "1946 World Series Game 7 – Boston Red Sox vs. St. Louis Cardinals". Retrosheet. Retrieved September 13, 2009. ^ "Boxscore: October 15, 1946". Baseball Reference. Retrieved October 9, 2016. ^ "2014 Sports Illustrated Sportsman of the Year: Madison Bumgarner - Sportsman - SI.com". Archived from the original on January 1, 2015. Retrieved December 23, 2014. Cohen, Richard M.; Neft, David S. (1990). The World Series: Complete Play-By-Play of Every Game, 1903–1989. New York: St. Martin's Press. pp. 208–212. ISBN 0-312-03960-3. Reichler, Joseph (1982). The Baseball Encyclopedia (5th ed.). Macmillan Publishing. p. 2154. ISBN 0-02-579010-2. History of the World Series - 1946 at The SportingNews. Archived from the original on 2008.